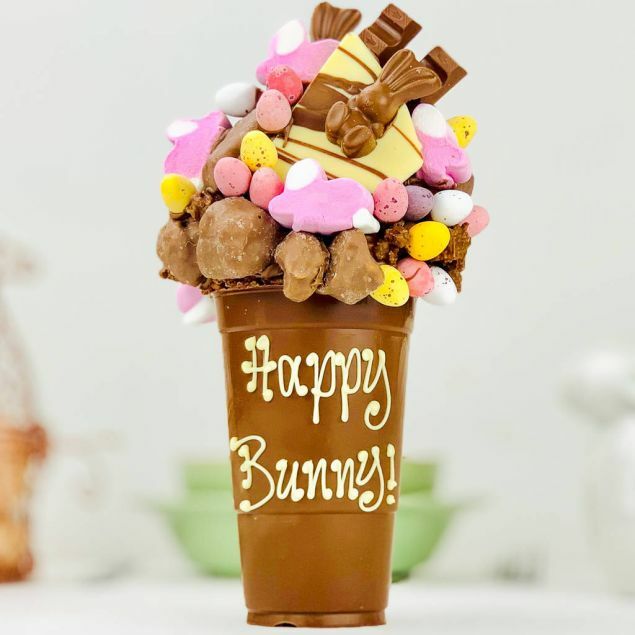 BunnyHops Smash CupGE01THIS PRODUCT CAN ONLY BE DELIVERED TO THE UK - Due to popularity, whilst we will do our best to dispatch as many orders as possible, we are unable to guarantee delivery in time for Easter weekend on this product. Smash Cups - The latest must have gift, and this one is Easter themed! This hamper will earn you 44 Hamper Points. 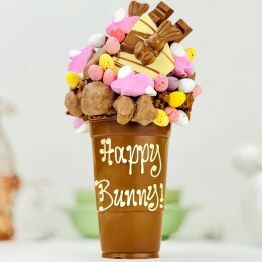 Let’s start with the cup made from creamy smooth Belgian chocolate and packed with all the favourite chocolates: just to list a few we have Malteser Bunnies, Bunny Mallows, Chick Mallows, Mini Eggs, Kinder Bueno, Chocolate Honeycomb, Belgian chocolate fudge cookie crunch. Once you have smashed the cup, tucked inside a secret message saying Happy Easter will fall out along with a further supply of chocolate, and our own recipe belgian chocolate crisp.